In a recent paper published in Political Psychology by myself from Staffordshire University and Karen Douglas and Robbie Sutton from the University of Kent, we found that conspiracy theories might be a way that people can maintain favourable attitudes towards society when the social system may be under threat. In other words, conspiracy theories may sometimes bolster rather than undermine support for the social status quo when its legitimacy is threatened. Conspiracy theories are associated with almost every significant social and political event, such as the suggested theory that the U.S. government orchestrated the 9/11 attacks. A similar thread throughout conspiracy narratives is that they point accusing fingers at authority (such as the government). Conspiracy theories single out a small group of perceived wrongdoers who are not representative of society more generally but instead are working against us. Believing in conspiracy theories may, therefore, give people the opportunity to blame the negative actions on these wrongdoers, thus then bolstering support for the social system in general; blaming a few bad apples to save a threatened barrel. This argument is in line with System Justification Theory which proposes that we all have a motivation to hold positive views about the society that we live in. When our society is threatened, however, we seek to defend or bolster the status quo; for example, people may use stereotypes – which are mental shortcuts about different groups of people – to justify differences between people to maintain the status quo that we are used to. In our new paper, we argue that belief in conspiracy theories may join the ranks of these system-justification processes. We tested the system-justifying idea across several research studies, using both undergraduate students and members of the general public. We found that conspiracy theories increased when the legitimacy of society was threatened, and that also being exposed to conspiracy theories increased satisfaction with the status quo when under threat. We found that conspiracy theories were able to increase satisfaction with society in general because people blamed society’s problems on a small group of wrongdoers, rather than society in general. Reference: Jolley, D., Douglas, K.M, & Sutton R. (in press). Blaming a few bad apples to save a threatened barrel: The system-justifying function of conspiracy theories. Political Psychology. A open-access copy of the paper can be downloaded via Research Gate. This post has been re-published from InPsych @ Staffordshire University. This entry was posted in Round-Ups, Social psychology. Bookmark the permalink. It has always seemed to me that it is alright to speculate about or believe in conspiracies by the ruled against the rulers, while there is a taboo against speculating about or believing in conspiracies by the rulers against the ruled. Is there a continuum too when the surrounding culture already has overarching paranoia baked in its bread? There are vast areas on this world where they believe the Vatican or other entities are to blame for their backwardness. Is it still a conspiracy theory – as named as such elsewhere – when the conspiratorial notion belongs to the base of ones cultural believes? 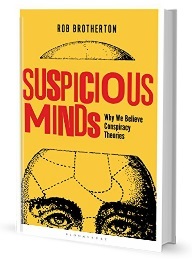 Since this is the age of (mis)information, do you think in the near future we will have a new psychological term or condition to explain conspiracy theorists as we learn more about them? Specifically for those who believe in easily falsifiable claims to the point where they practically devote their lives to their belief (e.g the earth is flat, vaccines cause autism, etc.) Surely, this extreme distrust of authority and denialism falls into the spectrum of some sort of mental disorder. And the one tracked way of thinking, where there is only one possible answer for some phenomenon and no other possibility can even be considered, I’m interested to know more about how this type of thinking arises and if there is anything that can be done to help these people? Do you think it is possible that there could be some sort of wiring in some people’s brains where certain functions like pattern recognition are over functioning at an extreme level? So that some people are born more prone to certain logical fallacies? Is this something that could be tested? Anyways, I really enjoy your blog, I’m absolutely fascinated by the psychology behind conspiracy theories, and I look forward to your future research.